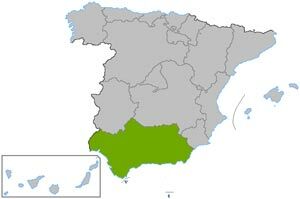 Andalusia (Spanish: Andalucía) is an autonomous community of Spain. Andalusia is the most populous and the second largest, in terms of its land area, of the seventeen autonomous communities of the Kingdom of Spain. Its capital is Seville. Andalusia is bounded on the north by the autonomous communities of Extremadura and Castilla-La Mancha; on the east by the autonomous community of Murcia and the Mediterranean Sea; on the west by Portugal and the Atlantic Ocean; on the south by the Mediterranean Sea, the Strait of Gibraltar, which separates Spain from Morocco, and the Atlantic Ocean. The British colony of Gibraltar shares a three-quarter-mile land border with the Andalusian province of Cádiz at the eastern end of the Strait of Gibraltar. Accommodation and holiday rentals from property owners with online booking. Also real estate offers with apartments, townhouses and properties for sale on Costa Del Sol in Southern Spain Andalucia. Holiday rentals on El Presidente on the Costa del Sol Spain. The leading property rental management company for accommodation and apartments on the Costa del sol Marbella. Our large selection of holiday rentals will meet all your requirements on El Presidente. We have vacation homes and holiday villas for vacation rental in the spanish villages of Andalucia around Nerja, Torrox and Mijas on the south coast of Spain. Spanish holiday or vacation? Listing of inexpensive top quality villas, apartments and beachfront real estate for holiday & vacation rental in Andalucia, Costa del Sol, southern Spain. We have the widest selection of quality self-catering Andalucian Apartments and Villas to rent in Spain updated daily, available for holiday or vacation rental. Our Apartments and Villas to rent are located throughout some of the most desirable areas of Andalusia, Southern Spain and the Costa del Sol, including Marbella, Puerto Banus, & Nerja. Publish and rent your Spanish properties Andalucia southern Spain on the internet with Costa Holidays. Holiday apartments and villas for rent throughout southern Spain includes Costa Blanca, Costa del Sol, Alpujarras etc. We help adventurous and discerning travellers to tailor a holiday that will be remembered for a lifetime. Whether your ideal is a secluded countryside mansion or a quiet haven in the center of a bustling resort, we are sure that we have the property for you. View property descriptions and area descriptions, photos, etc. A direct link between Europe and Africa, and the place where the Atlantic Ocean meets the Mediterranean, Andalusia has been fought over by numerous cultures since the earliest times of civilization. Discover Andalucia from the official site of Andalucia tourism board with information on lodging, restaurants, gastonomy, culture, art, sight seeing. Verdemar Nueva Nerja Holiday home Casa I Apartment C/Rafael Alberti Blq 5, P.